My Dog Door for Sliding Patio Door Is Drafty? Seal it with Insulation! The cold or hot air outside can seep into the house. It's even worse on windy days. Noise can get in, though this has not been as noticeable as the temperature. For years, I've always noticed the cold, but only in the winter. So by the warm weather of summer came around, the gap became a thing of the past. However, now that we've experienced a couple of cold winter seasons, I've finally taken the time to put in a fix. 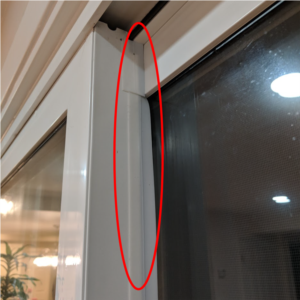 Since the gap created by the patio door not completely closing is a fair large gap that the vertically tall, this is the more important gap to seal. The best product I found to seal the gap is Weather Stripping for Doors and Windows. However, unlike traditional weather stripping that is thick, this one is thin more designed to block gaps that may rub against each other (as opposed to slam shut). Based on some reviews, I opted for the thicker version for $1 more. It's safer, but depends on how wide your gap is. Also note that if you purchase the 1 inch version, that the 1 inch includes the sticky portion of the silicone tape. The product itself was much higher quality than I previously imagined. The silicone tape is fairly thick and robust and I imagine would hold up nicely. Installation was fairly simple. It does become tricky trying to tape up such a long window, to insure the tape is straight. I installed both on the inside window pane and the outside pane. Took less than 10 minutes to install. The first night after installation, I already noticed it was slightly less noisy (we have a airport noise nearby), and slightly warmer than other parts of the first floor (next up is to fix the leaky front door and fireplace. It's basically thick tape that is only sticky on half of one side. This sticky portion is where you affix it to your patio door. The non-sticky side is used to block gap inadvertently created by the pet patio door. There may be additional smaller gaps wherever your dog patio door meets the door frame that may also be leaking air. For a quick check, check for sunlight coming through. If not filled, those gaps will leak air. To solve air leakage, use silicon caulking. If you don't already own a caulking gun and a tube of caulk and you anticipate more DIY home projects, a caulking gun is a eventual must have part of your toolkit. If not, a simple tube of silicon caulk (this one is waterproof, dries in 30 minutes, but is not paintable) will do the job. Simple squeeze a small amount of silicon caulking onto the area to seal up the hole. Depending on the caulking you get, it will take a different amount of time to dry. Ever since we moved into our home in Millbrae, our guests have commented our home is notably chilly. We felt it too, but wasn't sure what to do about it. Here's are the projects I've done to improve the temperatures inside my home. For those not familiar with Millbrae, it is a city in the SF Bay Area. The weather rarely gets to freezing temperatures in the winter and rarely gets to 100F in the summer. We never get snow.